It is well known that Telecom service providers have designed the traditional wire-line telecom and wireless network systems for high service availability, its reliability depends on the availability of power from the stationary battery bank in base sites and UPS system standby in operation office. But there must be individual differences in state-of-capacity (SOC) and internal resistance(IR) Value of batteries after used for a certain number of years even if common Battery Care Program is carried out. It is called the battery un-equalization. Due to the total floating charge voltage of the rectifier remains unchanged and keeps constant, when the battery pack is always in floating charging status, the floating voltage of the cells with larger IR will be higher than that of the normal battery, resulting in the normal battery's floating voltage is lower. Batteries floating charged in this unbalancing way for a long time without On Line Battery Capacity Balancer orOn Line Cell Equalizer, that will cause the higher voltage cells seriously dehydrated, and the lower voltage cell is in a state of under-charged. This way of vicious spiral formed will accelerate the base site batteries premature sulfation and early failure. This 12V On Line Equalization System--iBPS-1202E set a equalized charging function. If the terminal floating voltage of the battery system is higher than the standard value of protector system designed, the system automatically and smartly switches to the over-voltage balanced working state. When the voltage drops lower than standard value, it automatically changes to On Line Smart Cell Protector state. The decrease of battery IR and the improvement of the battery equalization lead to the battery life extension doubled or more. 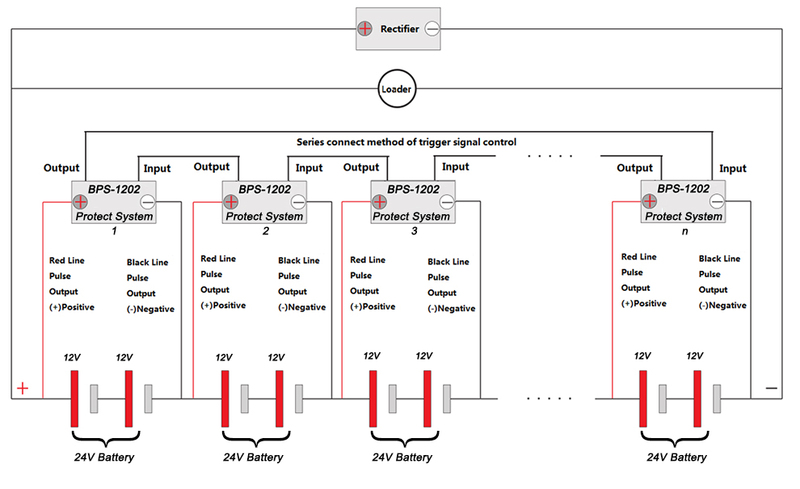 iBPS-1202E is the Smart Battery Saver and Monitoring system for 48V battery pack in series by 4PCS 12V cells. It is working as a new generation of high-tech products for daily battery maintenance and battery equalization in sites or other stationary power system. It is designed for the charging maintenance and life extension of new batteries in Telecommunication base sites, or used after our Off-line Battery Smart Pulse Repair System restored. It is used for 48V/36AH-300AH battery bank series by 4 PCS 12V/36AH-300AH Lead Acid Cells. Looking for ideal On Line Smart Cell Protector Manufacturer & supplier ? We have a wide selection at great prices to help you get creative. All the On Line Cell Equalizer are quality guaranteed. We are China Origin Factory of On Line Battery Capacity Balancer. If you have any question, please feel free to contact us.